Sign up with your email address to receive our blog post as soon as it is released! We respect your privacy. Your email will not be shared or distributed. Saint Construction Management teams up with an East Vancouver family to improve not only their living situation, but their future too. Dream homes come in many shapes and sizes. And for one Vancouver family that dream had to meet some very important needs. Warren Bente and Tess Prendergast spent years trying to work out a housing solution to suit their entire family, including their children, Calum, 21, and Bronwen, 17. 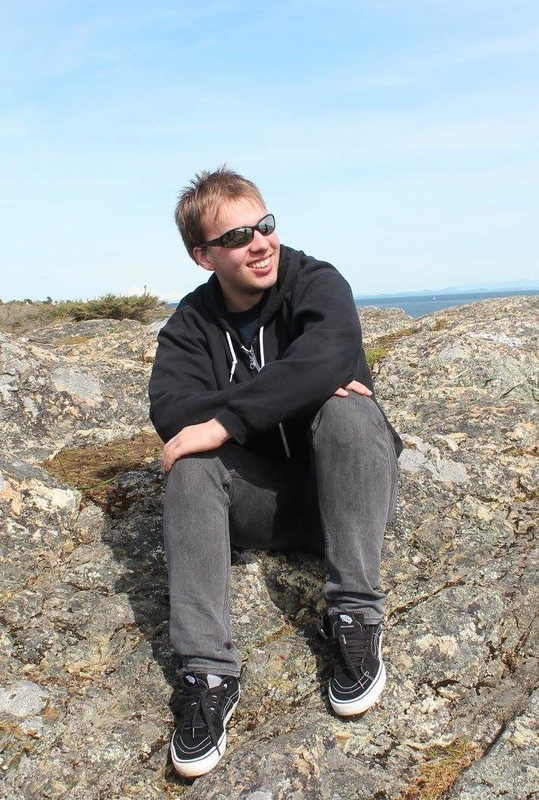 Calum has a disability that will require ongoing care, but also a desire to move out and live with friends. Calum will live in the back half of the new duplex. he gains INDEPENDENCE while warren and tess have the comfort of knowing they are right next door if needed. The family was introduced to Founder and Owner Scott Sheen in March 2016. Soon after, Saint purchased the property adjoining the family’s home, and guided them into an innovative concept to benefit all concerned. The end result will be Glen Park Village: a multi-family complex comprised of five strata units - two of which will be owned by Warren and Tess. Warren and Tess's property (left) pre-demolition and the Character home that will be retained and renovated. Warren, Tess and Bronwen will live in a two-bedroom infill house, adjacent to a three-bedroom duplex accommodating Calum, one of his friends and a live-in carer. It’s the perfect solution to a potentially difficult situation. While Glen Park Village provides obvious benefits for the family, Warren is also excited about contributing to the city as a whole. 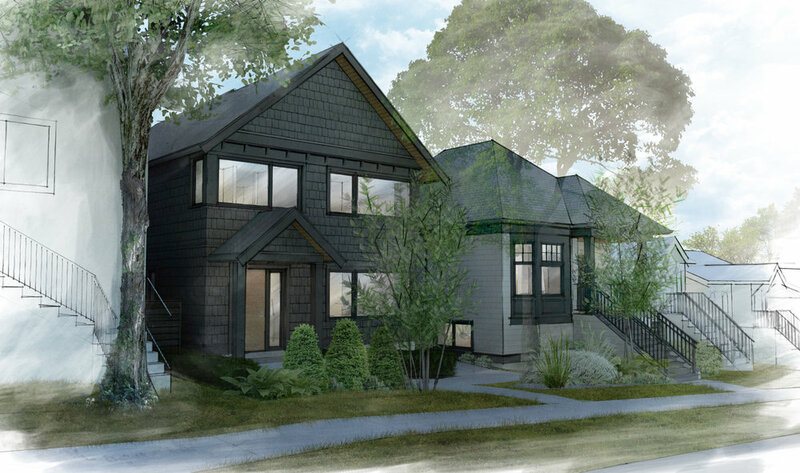 Renderings of the finished product from the front of the property. 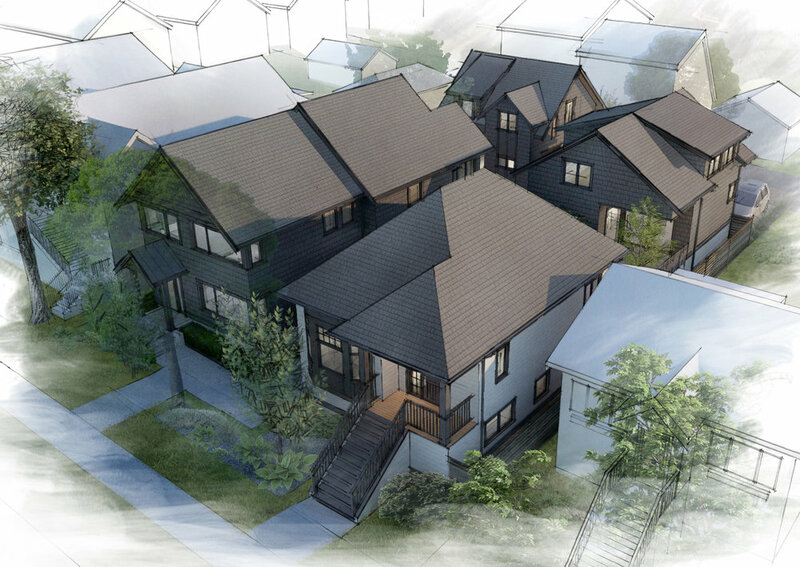 The development will be a modern concept design and build that complements the character home, first built in the early 1900's, and the well-established homes in the surrounding community. Not only will Glen Park Village deliver a dream home for Warren and Tess, it also relieves a huge weight off their shoulders by setting them up for retirement. They have a message for others considering a similar move. “We’re pushing the boundaries of what is possible, not just for the disabled, but for the elderly and for all families,” Tess said. © 2018 Saint Construction Management Ltd.